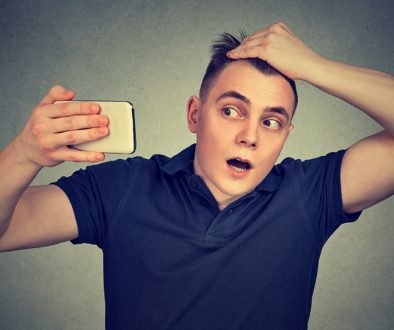 This article was submitted to us for publishing and was partially written by Dr. Carlos Wesley, who is recommended on the Hair Transplant Network. For a complete list of contributors to this article, scroll down to the bottom of this article. Hair transplantation procedures are used to treat various forms and degrees of permanent alopecia in both men and women. 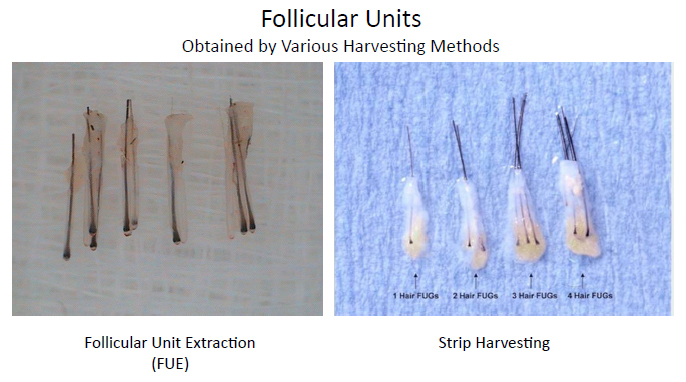 Intact hair follicles may be harvested from within the safe donor area of a patient’s scalp by either strip method or follicular unit extraction (FUE); each harvesting method has unique advantages and disadvantages. The refinement of follicular unit transplanting over the last decade has led to markedly improved hair survival and natural-appearing results. This article provides a broad overview of the techniques used by various hair transplant surgeons throughout the world. Founded on the principal of donor dominance (ie, hair follicles continue to grow in the new recipient area to which they are introduced as long as they would have in the donor area from which they are extracted), the field of hair restoration surgery (HRS) has evolved considerably since its inception in the 1950s. Natural-appearing results are consistently achievable and reflect a surgeon’s technical skill and artistic creativity. Patients should be in good health in order to undergo this form of elective surgery. Appropriate laboratory screening tests include, but are not limited to: complete blood count, serum chemistries, coagulation studies (PT, PTT, INR). It is also common for practices to screen for antibodies to HIV as well as Hepatitis B and C.
Upon initial patient evaluation, the physician must first determine the etiology of the patient’s hair loss. Only after first ruling out 1) systemic causes such as thyroid abnormalities, polycystic ovarian syndrome (PCOS), or iron-deficiency anemia, 2) dermatologic causes that may be treated medically, 3) and telogen effluvium (temporary hair loss that will resolve over a few months’ time), should a surgical approach to hair loss be considered. Both men and women may be deemed candidates for HRS as long as their donor area (both current and projected) is able to yield a sufficient number of hair follicles to adequately address the projected recipient area (a calculation termed “donor to recipient area ratio”). A family history of hair loss in both the maternal and paternal branches should be investigated and compared with standardized scales of hair loss in women and men (Norwood Pattern, Ludwig Pattern, etc.). Young patients (in their 20s) with a limited hair density in their donor area coupled with a projected Norwood Type VII or greater hair loss, for example, will almost certainly not have an adequate number of permanent “fringe” hair follicle reserve to address the future recipient area and often cannot be considered candidates for the procedure. Appropriately aligning patient and physician expectations is critical during the initial evaluation and consultation. Understanding the limits of a patient’s donor hair reserves, their hair characteristics, as well as their goals and motivation for undergoing hair transplantation can best help evaluate and articulate a projected outcome. Establishing this mutual understanding is one of the most effective ways to increase overall patient satisfaction. Patients should be provided with written information regarding both preoperative and postoperative instructions. After reviewing the patient’s list of medications to rule out any that may adversely interact with anesthesia administered during the procedure, it is important that various medications that may affect bleeding time be discontinued. Aspirin or aspirin-containing products should be discontinued 10 days prior to a session. Nonsteroidal anti-inflammatory drug use should also be halted. Many cosmetic surgeons advise patients to refrain from alcohol consumption or intake of vitamin E and fish oil for 7 days prior to the procedure due to their tendency to increase bleeding. Patients are advised to wash their hair with any shampoo on the evening prior or morning of the surgery. Once the region within the “safe donor area” (the region within the inferior parietal and inferoposterior scalp in which hair follicles are most likely to remain throughout a patient’s lifetime) has been determined, the hair within that region should be clipped to approximately 1-2 mm in length with either scissors or an electric trimmer. The donor area and recipient area into which the grafts will be placed should be prepped with a povidone-iodine (Betadine) antiseptic solution. However, scrubbing the recipient and donor areas with 4% chlorhexidine gluconate may be preferable in patients with white or grey hair as the Betadine may temporarily stain light-colored follicles. The use of perioperative antibiotic use remains controversial in HRS. The decreased risk of wound infection must be weighed against the increased threat of hypersensitivy reaction and the possible emergence of resistant organisms. Prophylactic antibiotic use is most effective when administered 1 hour preoperatively and is not questioned in instances of endocarditis prophylaxis or other precautionary uses. First-generation cephalosporins are most commonly used preoperatively. When hypersensitivity exists, erythromycin is an effective alternative. These prophylactic oral regimens coupled with topical antibiotic use along the donor wound postoperatively help reduce the already slim risk of infection. Some practices advise patients to continue use of oral and topical antibiotics for 3-5 days postoperatively. Preoperative analgesic and antianxiolytic medications are often given to patients in oral form prior to the surgery and intravenously throughout the procedure. In addition, local anesthesia is administered slowly and using a fine 30-G needle in order to minimize discomfort. Local administration of 1-2% lidocaine with 1:100,000 epinephrine along the inferior edge of the clipped donor area provides ample anesthesia while minimizing intraoperative donor wound bleeding. Local infiltration to create a ring block of anesthesia anterior to the anticipated recipient area remains the most commonly used technique for achieving recipient region anesthesia. Care should be taken in both the donor and recipient areas to limit the lidocaine dose to 7 mg/kg with epinephrine (maximum 500 mg) or 4.5 mg/kg without epinephrine (maximum 300 mg). After 2 hours, the local anesthetic should be reinforced with 0.25%-0.5% bupivacaine with 1:100,000 epinephrine (maximum 200 mg). This lasts approximately 4 hours. The patient should be placed in either a prone position or (less often) a seated position for donor hair follicle removal. Many practices employ postoperative compression surgical dressing not only to minimize local edema, but also to reduce the risk of graft dislodgement. Prior to positioning this dressing, surgeons should apply a topical antibiotic ointment, nonstick gauze, Kerlix gauze, and wrapped gauze to establish a turban-like pressure dressing. This dressing is removed on postoperative day 1 when the patient is given instructions related to scalp care. Corticosteriods may be administered orally (up to 60 mg) followed by a tapered dose in order to reduce postoperative facial edema as well as donor area discomfort. If an intravenous line is established, dexamethasone may be given in doses totaling 12 mg during the procedure. Some surgeons also recommend local adminstration of triamcinolone acetonide 2.5 mg/mL in 0.5% bupivicaine along the inferior donor wound edge or anterior to recipient site created along the hairline to minimize postoperative edema. Patients may experience postoperative discomfort along the donor wound edge. Typically, this is minimal and lasts only overnight. However, as this discomfort may correspond with edema along the suture line, some patients may require oral narcotics, especially if the pain persists for more than a day or two (rare). Generally, acetominophen with codeine, hydrocodone bitartrate 5 mg/acetaminophen 500 mg (Vicodan), or oxycodone 5 mg/acetaminophen 325 mg (Percocet) are more than sufficient to alleviate postoperative discomfort. Complication rates in hair restoration surgery are very uncommon. In one study, they occurred in 4.7% of patients and included enlarged scar (1.2%), folliculitis (1.0%), areas of necrosis in the donor area (0.8%), keloids (0.4%), bleeding (0.2%), hiccups (0.2%), infection (0.2%), and pyogenic granuloma (0.2%). This survey included physicians whose practice was not limited to hair transplantation, where the percentages are higher than those reported elsewhere. There currently exist two methods of hair follicle harvesting: follicular unit transplantation (strip harvesting) and follicular unit extraction (FUE). Both possess unique advantages and disadvantages. Regardless of which method is employed, the importance of extracting hair follicles from within the safe donor area (see the image below) remains paramount. Safe donor area. The shaded region represents the zone from which the highest percentage of hair follicles are most likely to persist throughout a patient’s lifetime. Extracting intact follicles from this area for subsequent transplantation ensures not only that they are the most likely to remain in their new location for the longest period of time, but also that any scar remaining in the area from which they were extracted will be concealed by neighboring hairs for the longest period of time. Maximum follicle survivability is also aided by transplanting only intact hair follicles that are not transected by traumatic extraction. To this end, with either strip or FUE methods, the skin incisions are angled parallel to the hair follicle (rather than simply perpendicular to the scalp itself) to minimize transection. Within the safe donor area, a strip is excised as an elongated fusiform ellipse of full-thickness scalp using either a single no. 10 or no. 15 blade or a double-bladed scalpel with blades mounted in parallel. Prior to strip excision, the desired donor region may be infiltrated at a depth of 4-5 mm with sterile saline tumescence in order not only to minimize follicle transection by aligning them more perpendicularly to the skin surface, but also to provide separation between the follicular bed base located within the superficial subcutaneous tissue and the larger nerve plexes and vessels which abound within the deep subcutaneous tissue. The width of the elliptical strip (generally ranging between 10–15 mm) is determined by the laxity of the patient’s scalp in order to yield the maximum number of grafts while still limiting tension upon closing the edges of the resultant wound with either sutures or skin staples. Regardless of the number of sessions a patient may undergo throughout his or her lifetime, only a single scar should remain. The scar from any prior session should always be included within the subsequent strip excision. 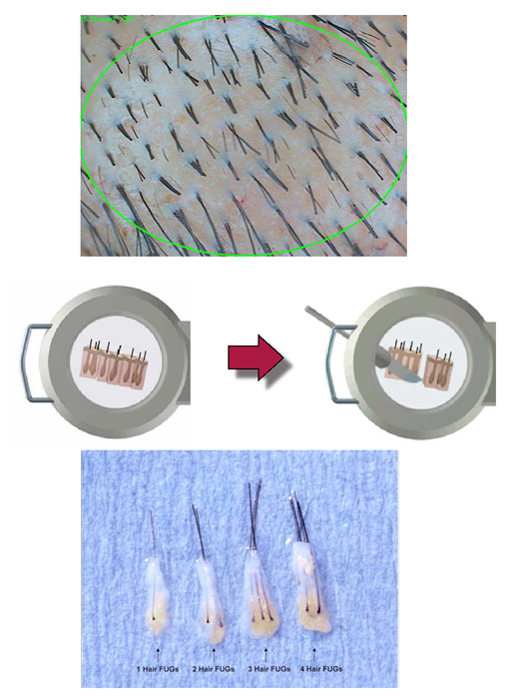 Individual hair follicles or small, naturally occurring groupings of 2-4 follicles (follicular units) may be extracted either manually or with a motorized rotating punch device using FUE. Akin to a cylindrical cookie cutter, the punch incises a 0.8-1.4 mm diameter circular scalp area. The punched-out follicles are then manually extracted with forceps. FUE has the advantage of not creating a linear scar, therefore shortening recovery time and allowing patients to wear their hair shorter in the donor area after the procedure. However, this method results in numerous hypopigmented punctate scars within the donor area. It may result in increased follicle transection rates (which reduce graft hair survivability), and it is more time consuming for the patient and physician. Furthermore, as each individual follicle extracted must be separated by three or more intact neighboring follicles so as not to create a uniformly alopecic donor area, the risk of needing to harvest follicles from a larger surface area that extends beyond the limits of the safe donor area is heightened (click image below to enlarge). 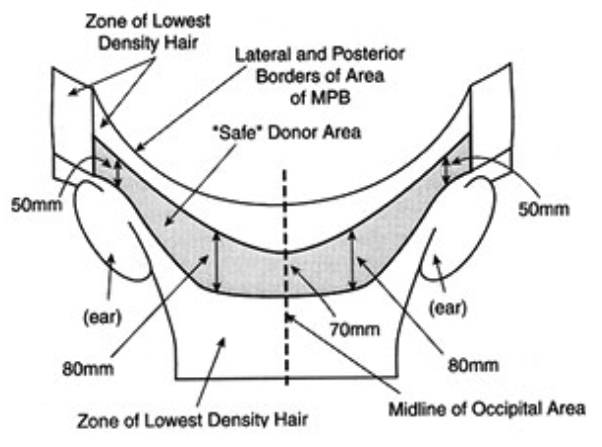 The safe donor area in follicular unit extraction. 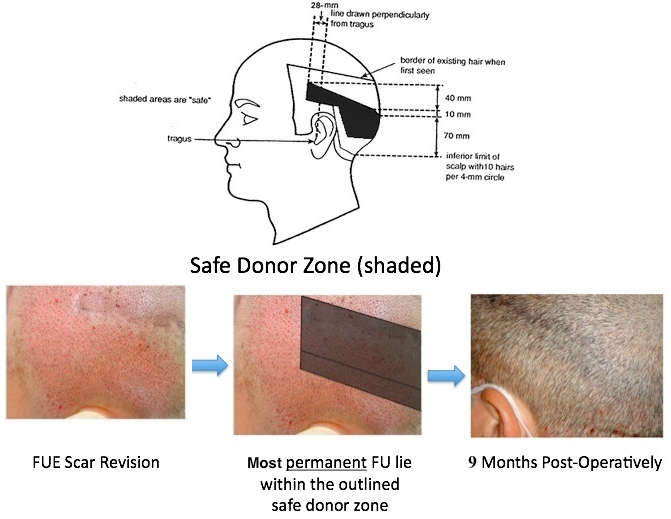 The safe donor area (shaded region) is superimposed with a markedly broadened zone from which hair follicles were extracted via follicular unit extraction. Harvest follicles outside the limits of the safe donor area may lead to exposed scars and subsequent transplantation of non-permanent hair. Over time, as the fringe hair beyond the safe donor area is lost, the punctate scars may be exposed and transplanted follicles harvested from this fringe area may disappear. After either method of harvesting (though to a much lesser extent with FUE), the follicular units obtained must be trimmed under microscopic visualization using a razor blade (click image below to enlarge). The graft dissection process. Hair follicles within the donor region of the scalp generally exist in clusters of one to four shafts of hair (above). Under microscopic visualization, these naturally occurring follicles are dissected out from the strip excised during harvesting (middle) in order to produce intact follicular units. In follicular unit transplantation (FUT), only hair follicles separated into their naturally occurring clusters of 1-4 (or more) hairs are transplanted, rather than large grafts containing multiple (3 or more) follicular units. The average naturally occurring follicular unit contains approximately 2.3 hairs. Resultant grafts should retain a pear shape in which the epidermis has been maximally trimmed while the dermal and subcutaneous tissue surrounding the follicle isthmus and inferior portion remains (click image below to enlarge). Two methods of hair follicle harvesting (follicular unit extraction and strip harvesting) tend to result in follicular units of slightly different quality. In general, follicular units harvested via the strip method possess more subcutaneous tissue around the hair follicle bulb. This may aid in protecting the follicular units from dessication and mechanical trauma during follicular unit placement. This optimal micrograft shape is frequently achieved after strip harvesting, but rarely from FUE. The cushioning provided by the intact surrounding tissue helps maximize graft viability by minimizing desiccation during pre-insertion storage and mechanical trauma to the follicle from handling. Various techniques are utilized to create and prepare recipient sites for subsequent transplantation of follicular units. With each method, the critical element of following the angle and direction at which the hair follicle exits the scalp results in the least damage to existing hairs and the most natural-appearing transplanted hair. The most widely accepted density of recipient site creation distributes 30 follicular units per square centimeter. Some practitioners advocate for dense packing of more than 40 follicular units per square centimeter. However, the viability of grafts may be compromised as competition for a limited blood supply increases. Various techniques exist for recipient site creation and graft insertion. Blades may be cut to match the size of the follicular units to be inserted. Hypodermic needles (18-21 gauge) may be used to make incisions for subsequent graft placement. Recipient site size increases as the surgeon moves posteriorly away from the hairline and the priority shifts from single, fine-caliber hairs to multiple and higher-caliber follicular units. A stick-and-place technique can be employed to virtually eliminate the time between which the recipient site is made and the graft is placed within it. A spread-and-place technique minimizes mechanical trauma from graft handling as the graft is placed into a smaller recipient site. Jeweler forceps or similar non-toothed forceps are generally used to gently place the grafts into recipient sites. Transplanted hair follicle viability is maximized by minimizing mechanical trauma to the follicle. This is accomplished by handling the subcutaneous tissue along the base of the graft rather than the graft itself. Furthermore, some implantation devices exist that allow for near-simultaneous recipient site creation and hair follicle insertion. Unger WU, Unger RH, and Wesley CK. Lebwohl et al. Androgenetic Alopecia Treatment of Skin Disease, 3E. 2008:36-38. Unger W, Unger R, Wesley C. The surgical treatment of cicatricial alopecia. Dermatol Ther. Jul-Aug 2008;21(4):295-311. [Medline]. Unger WP. Delineating the “safe” donor area for hair transplanting. Am J Cosmetic Surg. 1994;239-243. Salanitri S, Goncalves AJ, Helene A Jr, Lopes FH. Surgical complications in hair transplantation: a series of 533 procedures. Aesthet Surg J. Jan-Feb 2009;29(1):72-6. [Medline]. Knudsen RG, Unger M. Unger W, Shapiro R, Unger R, Unger M. Hair Transplantation. 5th Ed. New York: Marcel Dekker; 2011:419-422. Kim JC. Unger W, Shapiro R, Unger R, Unger M. Hair Transplantation. 5th Ed. New York: Marcel Dekker; 2011:404-6. 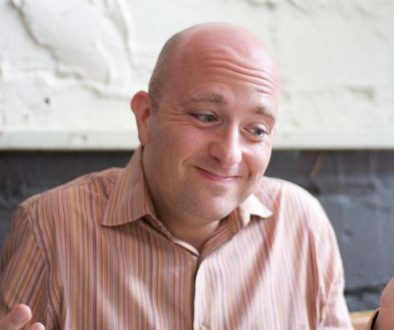 Hair Transplant Surgeon Dr. James Vogel is Nominated Baltimore Magazine’s Top Doctor for 2011	Getting a Haircut Before Hair Transplant Surgery?